The Galerie Orsay Paris is located on the romantic Paris Left Bank, two minutes away from the Orsay Museum and the spectacular riverside views of the quays of the Seine. 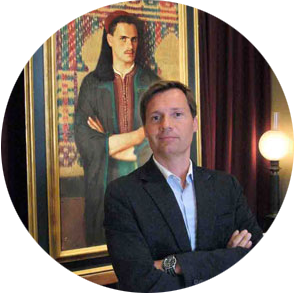 With a PhD in Art History from the Sorbonne and a degree from the École du Louvre, Simon Lhopiteau who is a member of the Société de l’Histoire de l’Art français and a certified expert with the Compagnie Nationale des Experts (C.N.E.) will gladly share his expertise in the fields of painting, sculpture, drawings and prints ranging from 1880 to 1980. The Galerie Orsay Paris is interested in such major 19th century schools and movements as Neo-Classicism, Romanticism, Realism, Impressionism, all the way to early 20th century Modernism and Abstraction. It periodically sets up shows, particularly in connection with the CERCLE BEAUX-ARTS RIVE GAUCHE.